How Does Car Insurance Work? Comp, Collision and Other Terms Explained! Did you know the per capita cost of a car accident is about $600 to $1,200? Should you get into one, though, you can expect to pay more if you don’t have the right insurance. In fact, the average payout for property damage was around $3,231 in 2013. For injuries, it was a whopping $15,443. These are the figures you’re looking to pay out of the pocket if you don’t get car insurance. How does car insurance work, anyway, and how can it protect you? Read on to find out what it is, how much you’ll pay, and how it works. Car insurance provides a safety net for potential financial hardship. You pay a premium every month, and if you get into an accident with your car, your policy would then cover you. It’s a requirement in almost every state since most people wouldn’t be able to afford to self-insure. If another person gets involved in an accident with you, you’ll have to pay for their medical expenses if you don’t have basic insurance. 2. How Does Car Insurance Work? Your car insurance will kick in once you get into a car-related incident where you’ll have to shell out money. Whether they’ll shoulder the costs or not will then depend on the situation and the type of coverage you have. If you’re in an accident and are at fault, liability insurance pays for the damages you’ve caused to the other party. There are 2 types of this insurance, although you might have to get both. Property damage liability insurance covers the other party’s property. This includes their vehicle, mailbox, fence, and more. For injuries and so, the bodily damage liability insurance pays for that. This is the basic coverage of new car insurance and a requirement in most states. However, you have to take note of how much is the least amount of coverage per person. The liability coverage limits will often list 2 numbers. These are the coverage limits of 1 person and the maximum coverage for 2 or more people in an accident. Note that liability insurance won’t pay for your own expenses. If you damage your car and you’d need medical attention, you’d have to pay for the repairs and doctor visits yourself. Personal injury protection (PIP) covers your own and your passengers’ medical expenses. It’s a type of no-fault coverage, which means it will pay for the costs of your medical needs whether you’re at fault or not. Even when you’re not in a car, and another car rams into you, PIP will also take into effect. It has broader coverage, although it will vary by state. It can also pay for your physical therapy, rehab, and even childcare up to the limit of your policy. It may also cover funeral expenses and lost wages. For these reasons, many states also mandate this by law. This can also cover the medical expenses of those in your car at the time of the accident. It’s broader, though, since it can also cover your family members if they get in a car accident without you. Like PIP, it can also provide coverage for you even if you’re a pedestrian or a cyclist who got into an accident caused by another driver. If you have health insurance, medical payments coverage will take into effect after it. Let’s say you’re facing $40,000 in medical expenses due to a car-related incident and limits on your health insurance will only cover up to $25,000 per year. Medical payments coverage will then pay for that extra $20,000. It will even cover for your copay and the doctor’s fee for future doctor visits after your accident. Comprehensive coverage is for the incidents out of your control. This includes natural disasters, vandalism, theft, fire, and more. In other words, it will pay most of the time for repairs or the replacement of your car if the damage caused by the driver of another vehicle. If hail or a hurricane caused some damage to your car, this covers the expenses related to this specific incident or claim. It will also pay for damages caused by flooding, although you can get separate coverage for that. It also pays for damages caused by a falling branch (or tree), rocks, and other objects. If you hit a deer or some other animal damaged your car, comprehensive coverage will take into effect. Note that this will not cover damages that your car causes to another drivers car or other valuable property. It won’t also pay for damages to your car caused by running into buildings or a light post. This may or may not be optional, depending if you own your car or not. If not, comprehensive coverage is optional. Say you hit that light post. Comprehensive coverage won’t cover that, but collision coverage will. It pays for the repairs to your car or whichever car you’re driving when you hit another object. Still, it will not pay for damages caused by animals or hail. It may apply for rental cars you’re driving, although you’ll have to check with each state if that’s the case. If you get into an accident that’s not your fault and your car obtains some damages not covered by the other party’s liability insurance, collision coverage will also kick in. Collision coverage isn’t usually mandated, but it may be a need in some cases. For example, it may be compulsory by the lender if you’re leasing your car. Not everyone you’ll meet on the road has the proper insurance. In fact, 13% of motorists aren’t insured, and it’s not impossible to get into an accident where they’re at fault. In that case, you don’t have a choice but to pay for your own expenses, which might leave you in a financial ditch. If you have this type of coverage, though, it will take care of your expenses for you. This is why this may be compulsory, so check with your state if that is so. 3. How Much Does Car Insurance Cost? Car insurance companies calculate the premiums depending on your risk factor. If you’re a low-risk driver, for instance, your rates will stay down. They base this on several factors: your car, your location, claims history, driving record, and how much you drive. Some car models, for example, are safer and have lower market value. These would cost less to insure, and if you live in a low-crime area, your insurer won’t charge you as much as they would on a policyholder living in a high-crime area. If you have a history of getting tickets and into accidents, they might consider you as high-risk. If you also expect to drive your car often and over long distances, this may increase the cost. They might also factor in your age, marital status, occupation, and your credit history. Note, though, that some states don’t allow insurance companies to use your credit history for calculating premiums. Your choice of insurance policy will factor in, as well; if you want a higher payout, you pay higher premiums. 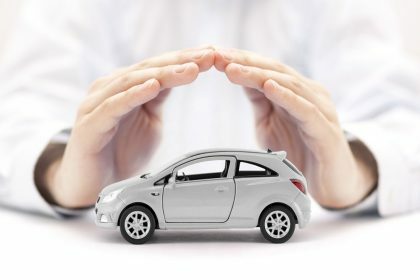 You will have the option to add extra coverages such as rental car coverage in the event of repairs and GAP insurance, that will also likely increase the cost. The coverage you’ll need will first depend on the minimum requirements of your state. Almost every one requires that you have liability insurance. Some may also need you to have a PIP and uninsured/underinsured motorist insurance. Check with your state first and then decide if you want extra coverage because the minimum isn’t often enough. Say that the required amount is $50,000 in coverage. You would have to shell out more than that if the damages you caused exceeded that. You’d want more if you’re in a high-risk area, especially where cars often get stolen. 5. How to Get Car Insurance? Before you drive off the dealership with your new car, you must already have car insurance. This means you have to shop car insurance policies before you even shop for cars. Once you already have a policy lined up, it’s only a matter of calling from the dealership to provide the vehicle identification number to the insurer. This will then “activate” the insurance. After which, the dealership will allow you to take home your new car. You may talk to an insurance agent to discuss the right policy for you. You can also browse the internet for online insurance companies. In most cases, you’ll be able to buy a policy online or over the phone. You may then print a copy of your policy and wait for your insurance ID. Ask your provider also if they have an app where you can access your proof of insurance. You now know how does car insurance work, but there’s a lot more to learn about finding the right insurance for you. For more information, check out the driving and insurance sections of our blog.